Stepping into the Hangman’s Tree Ice Cream Saloon is a feast for the senses. The friendly staff welcomes you as you enter the door, and your eyes are immediately drawn to the plethora of detail to historical adornments. After the initial feeling of stepping into history, the staff is there, ready to take your order of a tasty treat. While the menu choices will grow with the business, customers are currently able to choose from 20 different flavors of ice cream and two flavors of sorbet. 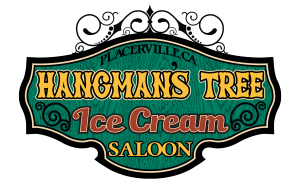 The Hangman’s Tree Ice Cream Saloon features Cascade Glacier ice cream, which is made in Eugene, Oregon, with fresh milk that is rBST (hormone) free. Any of the 20 flavors can be ordered in a cup or a cone, with an assortment of toppings. Don’t want a cup or cone? How about a banana split, sundae, ice cream float, malt or milkshake? After you get your food, sit down and relax to take in the scene. From the historical mural, to the antique hanging chandeliers, and then the myriad of historical framed artwork, you are in for a treat!